Five days over Thanksgiving weekend. That’s all it took to launch Product Hunt, the website that’s rapidly becoming the go-to water cooler and discovery tool for product enthusiasts, startup founders, and even venture capitalists. The premise is simple: every day Product Hunt lists the best new products. Visitors can then upvote them and/or leave comments. The more votes a product has, the higher it rises in the list of products for that particular day. Along with being the right website at the right time, Product Hunt has taken five specific actions that impacted their growth in major ways. In this post, I’m going to break each technique down for you and show how you can apply each one so you can grow your business faster. 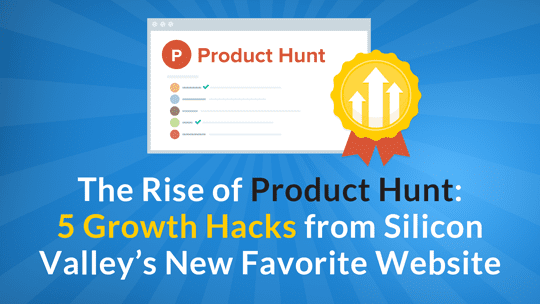 The founder of Product Hunt, Ryan Hoover, didn’t just wake up one morning and decide to throw together a site that features a bunch of cool products. The idea simply came from conversations he was having with friends and Silicon Valley entrepreneurs. “We often talked about new products, usually saying ‘have you seen that new product that just launched?’ It’s water cooler topics in the Valley, but I couldn’t find a place online to discuss new products,” Hoover told TechCrunch. So what happened next? He built the website, sent it to his friends, and the rest is history? Nope. Think about it — if you need a quick and easy way to discuss something with friends, you don’t usually build an entire website from scratch. You use an existing medium. That’s when Hoover created the Product Hunt email list in about 20 minutes using a simple link sharing email service called Linky Dink. From there, Hoover reached out to his friend, Nathan Bashaw. Over Thanksgiving weekend, Bashaw helped him build the website based on a combination of design elements that worked for other sites like Reddit and Hacker News. Product Hunt evolved based solely on need. Every phase was validated before Hoover invested time and resources into building something. He followed the natural progression of need — a technique that can save businesses of any size tons of money and headaches. Product Hunt is the product of asking all the right questions. The key thing to remember, though, is how Hoover was able to ask the right questions — he focused on need above all else. Need #1:My friends and I are always talking about the latest products, but we don’t have a way to easily share all of them with each other. Solution: Create a curated daily email of the latest cool products. Need #2: This email list is a great way to stay informed, but not a great environment to have conversations with larger groups of people around the products. Solution: Create a website where visitors can comment on each product. Need #3: The website needs to be intuitive, functional, and encourage interaction. Solution: Base the design off of the most popular sites with a similar premise. Follow this sequence with your own business, services, and products. Instead of releasing simply what you think people might like, develop a hyper-awareness of need. Keep your eyes and ears open, and when you see a need going unfulfilled in your space, find a way to fill it. Product Hunt only allows around 1% to 2% of monthly visitors to actually post products. At first glance, this may seem counterintuitive. After all, if more people were allowed to post products, those additional posters would share their posts on social networks and attract more traffic. So why only allow 1% to 2% of monthly visitors to post? The reason is simple: Product Hunt wants to make sure every post is high quality, interesting, and worthy of a conversation — because those are the exact ingredients that attract a smart audience. Useful feedback: Many commenters actually leave feedback you can use to make your product better. Like posting ability, commenting ability has been given to only a small percentage of visitors. This ensures that comment value stays high as Product Hunt continues to find its way as a business. Early adopter / power user awareness: This is an audience that visits because they’re passionate about products and love to use them. Potential investors: It doesn’t happen every day, but according to Hoover, there have been several cases of investors discovering products on Product Hunt, reaching out the the founder(s), and investing. 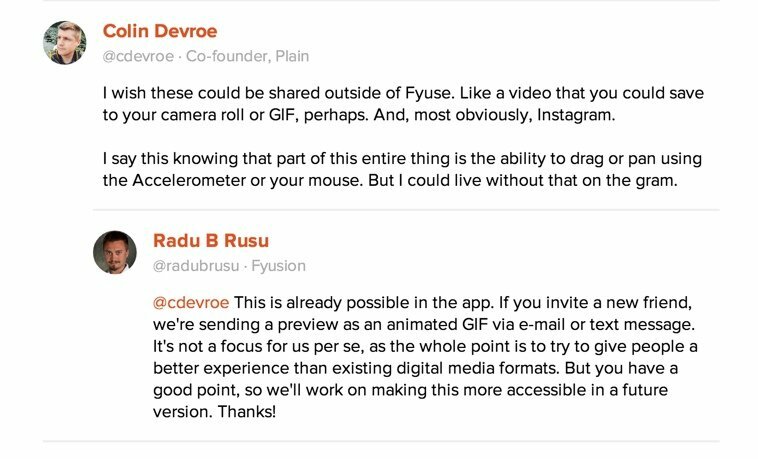 An example of useful feedback for Fyuse, a spatial photography app posted on Product Hunt. Instead of blindly pursuing every bit of traffic you can get your hands on, get laser-focused on the specific types of visitors you want to attract. Not only will you then know whom you’re targeting, you’ll also better understand the needs your business must fulfill. Publish content on platforms with smart, engaged users, like LinkedIn. Develop relationships with writers for sites like TechCrunch and learn to pitch them the right way. It’s worth the time and effort to attract smart, engaged users. Don’t put off going after them. Like we just discussed, there are numerous benefits of getting your product in front of Product Hunt’s smart audience. Getting featured, however, is only the beginning. Getting your product upvoted is what makes it even more beneficial. 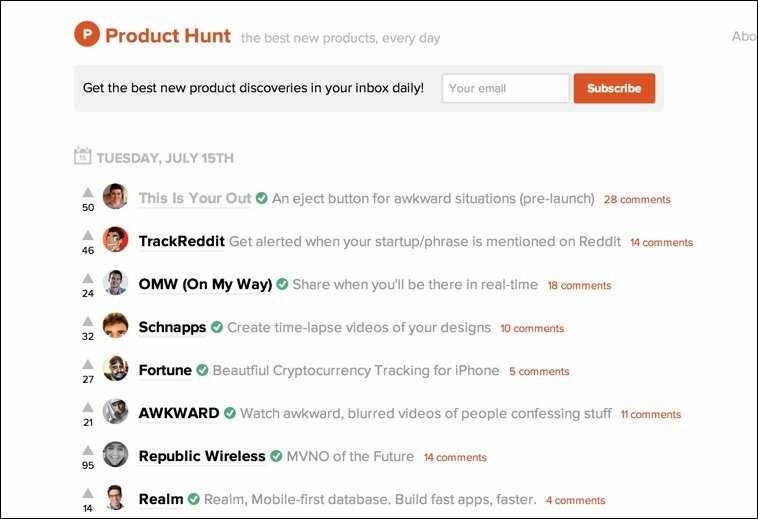 Like Reddit and Hacker News, two of the sites Product Hunt was modeled after, visitors can upvote any product. The more upvotes a product gets, the higher it climbs in the list of products for the particular day when it was posted. A look at the simple design and structure of Product Hunt’s home page. You’ll notice that, unlike Reddit, there is no downvote option. This is consistent with both Product Hunt’s culture of constructive criticism and their tagline: “the best new products, every day” (emphasis added). This feature adds to the fun of the website, but its real value is the way it motivates product owners to share their listing and recruit their followers to upvote their product, which pushes more traffic to Product Hunt. Obviously, this an upvoting feature wouldn’t work for most businesses. But that’s not the essence of this technique. Install a scrolling share bar on all of your blog posts and content-rich landing pages. This makes it as easy as possible for your visitors to share your most valuable content. You can find many free WordPress plugins that do this here. 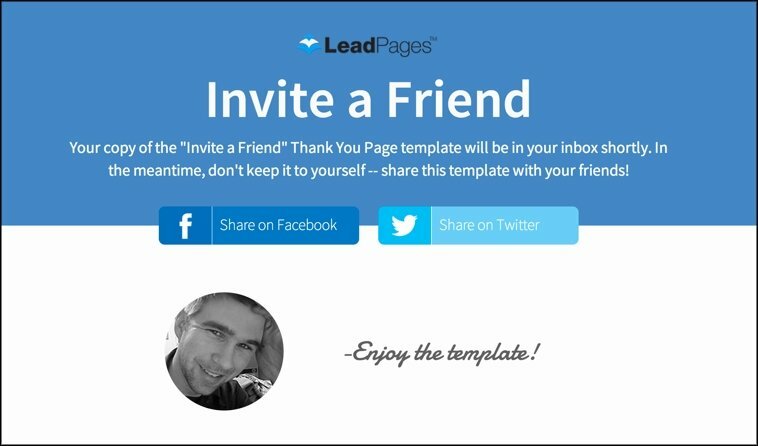 The “Invite a Friend” Thank You Page template from LeadPages. When visitors opt-in for your email list, they are in a state of hyper-compliance. Instead of directing them to a thank you page that simply prompts them to check their email, you can ask them to share the page of your choice and further utilize that state of compliance. If you’d like a free copy of this template, click here and we’ll send it your way. Note: If you’re not a LeadPages customer, using the template will require some coding ability. Attracting visitors to any website is a challenge. But getting those visitors to become users and interact with another is an even bigger challenge. That’s why it pays to make the signup and user experience as easy and frictionless as possible — and that’s exactly what Product Hunt did. Integrating with Twitter also allows Product Hunt to piggyback on visitors’ trust of a well-known brand during the account creation process. The people in Product Hunt’s target audience are already using Twitter to talk to each other about products. Even though Product Hunt is trying to consolidate those conversations to a more specific location, they’re still allowing visitors the familiarity of the platform they’ve been using to have said conversations. When we introduced one-click Facebook registration as a LeadPages feature, many users saw sign-up conversions increase — especially when they already had a target audience that was active on Facebook. 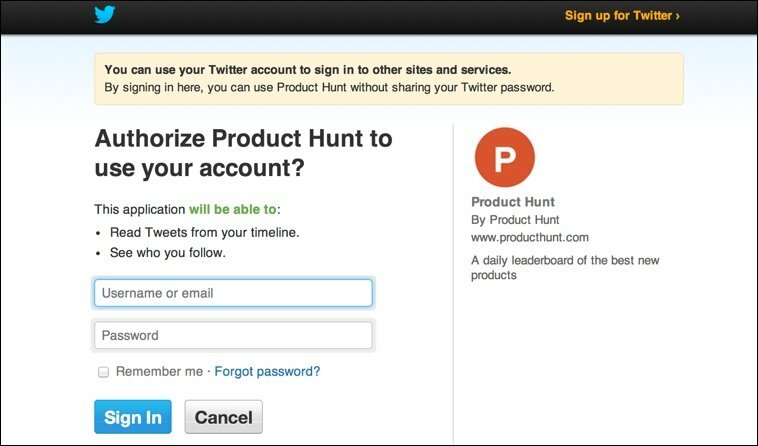 Though Product Hunt’s Twitter sign-up takes more than one click, it still allows users to sign-up with a popular service they already use. Product Hunt will most likely get every user’s best email address, since most people who sign up for Twitter do so with the email address they use the most. Integrating with Twitter allowed Product Hunt to avoid the extra work of setting up their own user account management system. Identify the areas of your website that create the most friction for your visitors. This might include account creation, email opt-in forms, blog comment sections, or query submission pages, for example. If your target audience is highly active on a particular service like Facebook or Twitter, you can often experience a bump in signups, opt-ins, or engagement when you test out integrating with that service. A blog commenting system like Disqus, for example, allows your visitors to sign in using Facebook, Twitter, or Google, in addition to creating their own Disqus account if they’d like. 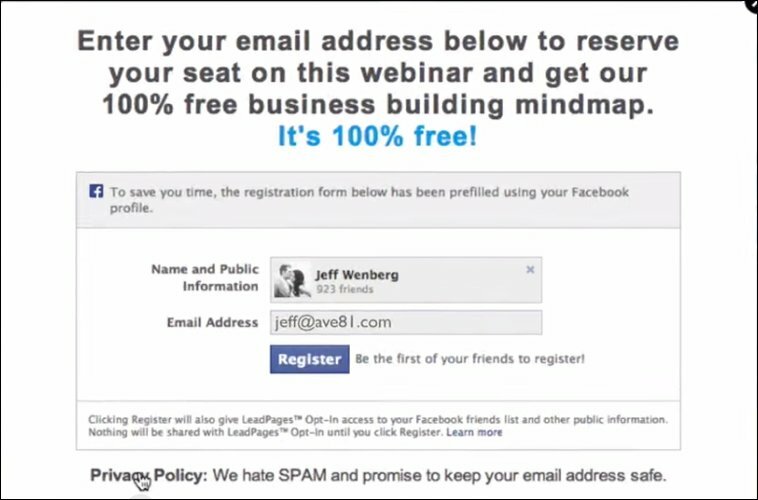 If you’re a LeadPages customer, you can try using the one-click Facebook registration feature I mentioned earlier for your email opt-in forms. One-click Facebook registration automatically pre-populates fields if the visitor is currently logged into Facebook. When it came time to build the official Product Hunt iOS app, they could have just designed it themselves and surprised users with a quick release. Instead, they took the time to get feedback from their users (the ones who will be using the app the most). Remember, Product Hunt attracted a smart audience, so they got great feedback from intelligent, product-obsessed people, including many who have built their own iOS apps. One of many examples of great feedback Product Hunt received on their iOS app. A couple of the earlier techniques discussed in this post are at play in this one. Product Hunt is continuing to follow the natural progression of need (Technique #1) by going mobile. They’re also continuing to reap the benefits of cultivating a smart audience (Technique #2) as you can see by checking out the app feedback. It’s easy to say you pay attention to your users’ needs and wants. It’s another thing to actually do it. It takes effort, patience, and the ability to discern between good feedback that will help the vast majority of users and bad feedback that will merely distract you from better investments of your time and resources. Open up your inbox: If you have an email list, make it as easy as possible for recipients to respond to you. Send emails from an actual “From” name and address instead of something like “DoNotReply@BusinessName.com.” Encourage recipients to hit “reply” if they have a question. 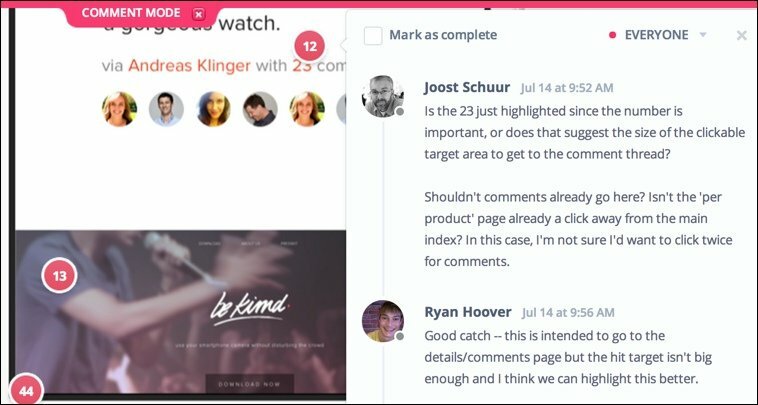 Copy this same technique: This may be stating the obvious, but if you’re designing something for an existing base of users, don’t hesitate to use a tool like InVision to let them check it out and give you feedback. Not only will you walk away with ways to improve your product, you’ll also create excitement for your new product by letting your audience have a sneak peek. Invest in top-quality support: If your business is big enough to necessitate a support team, don’t skimp. Invest in the best support staff you can. Realize quality support is integral to your business’s success, and that excellent support people are vitally important members of your team. While these five techniques have certainly been important to Product Hunt’s rapid rise, they’re also not the only ones at play. What else have they done well that other businesses can implement? Leave a comment and let us know. And remember, if you’d like a free copy of the “Invite a Friend” Thank You Page template mentioned earlier, click here and we’ll send it your way.